The gridvu is now available as an app at the Apple store. The gridvu is a viewable grid system that helps the artist to observe the interplay of visual elements in terms of scale, direction and location. An innovative yet simple tool for artists, the gridvu simplifies scale and proportion by making it easier to locate the subjects’ center. The grid system breaks down sizes and distances into easy-to-calibrate sections. A clear viewing grid provides a reference for the closer observation of lines and shapes in your art work. 1. Locates subject’s center easily for effective placement of your subject on the working space. 2. 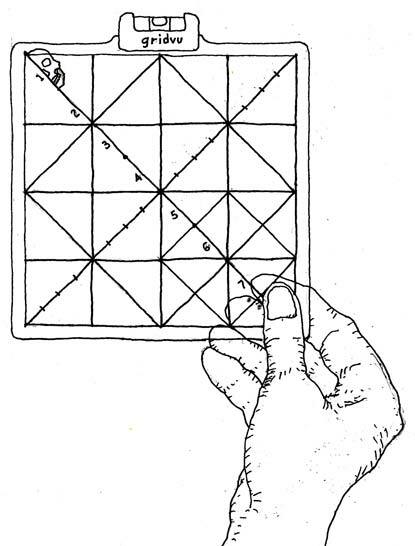 Unique grid system is designed to make a quick estimate of the size and location of line and shape. 3.The special ‘head length’ diagonal line is calibrated and replaces the thumb-and-pencil method used in sizing the figure for life drawing exercises. 4. Grid system is applicable to all types of drawing and painting situations. i.e., figure work, portraits, landscape, still life subjects and murals. Copyright © 2018 Website by E-Munkey Infotech Pvt. Ltd.